Curiosity arrives at Mars this weekend! Our newest and largest Mars rover, Curiosity, will arrive at Mars Sunday night or Monday morning, depending on your time zone (image from Wikipedia). I say “will arrive at Mars” because we won’t know if it landed safely or just hit Mars until 7 minutes after the fact. As you can see from this nifty calculator, the distance between Earth and Mars is currently 152 million miles and growing. The landing is scheduled to occur at 10:31 PM, PDT, on August 5, or 1:31 AM EDT, or 5:31 AM UT/GMT. 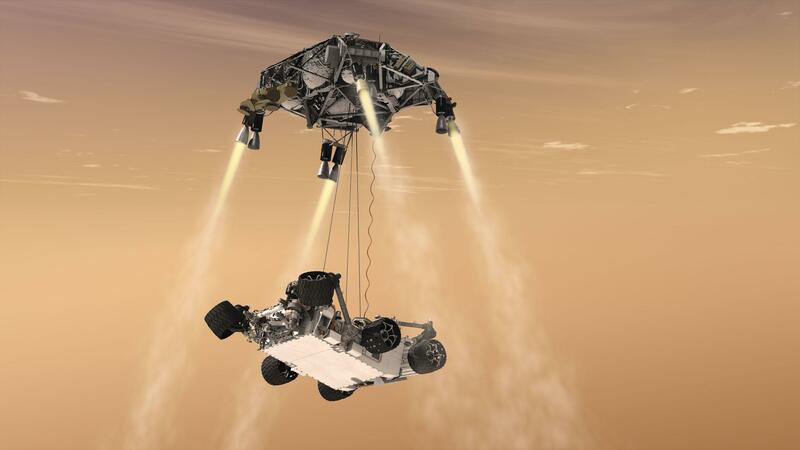 This video about the landing explains something of the difficulty and complexity of landing a BIG rover on Mars, and some (but not all) of the justification for going with the never-before-attempted skycrane landing method.